Salam. After four years in IIUM, I can see that there are lots of events which requires a design job. This entry is dedicated to all creative students especially KAED students. I don’t know why only a few KAED students involved in university programmes. There are lots of design jobs awaits talented students and its good for your own portfolio. Besides, it is also one way to contribute to the university too. For big events in Cultural Activity Centre or Main Auditorium such as Taaruf Week or Interschool Debate, stage design is important to give good impression for the event. It can be as simple as hanging a backdrop and also creating structures, decorative items and other props. Usually, Preparation and Technical committee will have to do this job. Printed backdrop is the easiest way but printing a large backdrop will cost a lot! Countdown board is one way of promotion as well as creating awareness of the program. It will be situated on the road side. Usually, the countdown board is created using wooden materials and a committee in-charge will have to change the countdown number manually everyday. Its another additional task for Prep & Tech committee too. Signage design is meant to show the direction to the venue of the events. It can be as simple as A4 paper mounted on the wall or even a structure on the road side to show the direction. Usually, its a Prep & Tech job to prepare the signage. I prefer to call it as e-backdrop because its an electronic version of a backdrop. E-backdrop is displayed on the screen. It requires some graphic design works and it can be created using Adobe Photoshop, MS Powerpoint, SwishMax and also Flash software. Usually, Multimedia committee are responsible to do this job. This is what I’ve been doing most of the time as a Multimedia committee. Usually it is called as multimedia presentation and it is meant for launching ceremony or as an aid for some event such as IPAC. The video can be created using any video authoring tools such as Windows Movie Maker, Corel (Ulead) VideoStudio, SwishMax, Adobe Flash, Adobe After Effects as well as combination of these softwares. Website or blog design is one method of promotion. Usually, big events such as Convest and Engitex will create their own website using .com domain. Creating a website is important because students can gain some reputation when requesting for sponsorship. Besides that, in this cyber age, website is the best way to provide related information of certain events. A good website design with good content is vital too. Multimedia committee are responsible for this job. I’ve tried to create a website for Taaruf Week but it is hard to maintain with latest entry since I’m not part of it anymore. Identity or logo design is very important for an event. The logo will be used in every aspect of the event from letter head, proposal or paper work, stage design, banner and buntings. Anyone can create the rough or sketchy logo design but usually Multimedia committee will have to do the digital version through vectoring stage. I prefer using Adobe Illustrator or Flash to get this thing done. T-shirt design is not just for an event. It is also for clubs and societies too. In big events such as Convest, the head committees will have different attire such as jacket to differentiate with other committees. Usually, Special Task committee are responsible with the shirt design and also placing order and distribution. Name tag is important to differentiate a committee, participant and others. It shows the name and position of the committee. 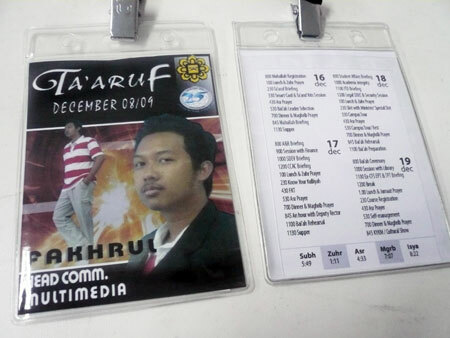 Usually, Special Task or Multimedia will create the design as well as printing and attaching the lanyard. However, there are also some students who provide the service of name tag with the price ranging from RM1 to RM2 each. A booklet contains brief information about the program such as the objective, tentative and list of committees. Usually, Special Task committee are responsible to provide a booklet. It can be as simple as 3 sided pamphlet style up to few pages that include list of sponsors too for bigger events. Booklet can be nicely done using MS Publisher and Adobe InDesign software. Banner design is an important promotional tool. It has big size and it can give good impact and awareness to the public. However banner is costly and the price range from RM100 – RM 250 depends on the print shop. However, if you have budget limitation, painting your own banner is good enough to save the cost. Both printed or painted banner need a good design which can give information for students as they passes by. Usually, Special Task or Promotion committee are responsible with the preparation of the banner. Bunting is a smaller and slimmer version of a bunting. It is hanged on a lamp post along the road. Usually, the dimension is 2 times 5 feet long. A bunting is cheaper than banner and the price range is within RM40 to RM50 each. Bunting needs a good design because it is targeted for motorist which has limited time of looking at it. It should have large typefaces of the important information of the event. Its hard to read bunting with cramped and small wordings. Usually, Special Task or Promotion committee are responsible with the preparation of the banner. It is better to produce both banner and bunting using Adobe Illustrator because the images won’t be pixelated. For Photoshop, it requires large image size and high resolution for printing purpose. Poster is one of the best and effective promotion method in the campus. It can be in full colours or just plain black and white. Black and white or photostated poster is just fine but coloured poster can attract more audience. Poster with good design can attract students eventhough it is plain black and white. This was my attempt of designing a poster in monotone. Usually the size is A4 or A3 and Special Task or Promotion committee are responsible for it. The poster can be done using MS Office or Adobe Photoshop and Illustrator. Handbill or fliers is a small version of the poster design. It is meant for distribution for all students either mounting them on the hostel door or distribute them while students is eating in cafeteria. Again, either Special Task or Promotion committe are responsible to prepare the handbills or flyers. It requires patience to cut the papers into the handbill size. By the end of the day, students want to be acknowledged of their involvement through the certificate. Some events will create their own certificate design. Usually, Special Task committee or the Secretary are responsible to provide the special certificate design. Usually, the design is made using Adobe Photoshop or Illustrator. In a conclusion, there are four bureau that truly requires a creative talent. Students can choose which one and I recommend that you choose Multimedia, Special Task, Publicity and Promotion as well as Preparation and Technical Bureau. Design jobs wait for all of us. We have to grab it. As in Malay proverb, “Bulan takkan jatuh ke riba”. Note: These design jobs are voluntarily based. You become the committee and you’ll have to do it. However, some jobs will be outsourced to others (freelancers) who can provide good product. You can view my portfolio to see my design. You can have free design consultation with me on above matter. Feel free to contact me here. Thank you. I’m not big on commenting, but nice post. I always found beneficial quality information from this site! Hi Sandy. thanks for the comment. Really appreciate it. Do come and visit my blog again! thank you! salam bro, I’m AAD’s student, i’m just recently involve in some of iium events. Recently I’m involving in making montage of KUDU’s Toy Competition program and also involve in designing IRIIE logo for the coming IRIIE exhibition. But, I’m still new on these, especially on afterfx. It’s really good having these experience, but I think the main problems for KAED students is about the time. To much works made us didn’t care what happening outside KAED.. maybe it should be announced.. hehe.. but I’m myself get the job from the lecturer. If not, I doesn’t know about the vacancies. I’ve read much about your involvement in design, it’s sound great.. thanks for sharing..
hye,im event management student @ Uitm, im in charged in multimedia bureau for our final project. Can you give me tips on how to design a creative banner or bunting for ‘wedding carnival’, as im still new in these..and i dont know where should i start, what kind of software i need to do design job..
Hye aien. Some quick guide to start your job. ouh thanks for the info. Btw, may i know on how to work with WBS for multimedia and design bureau and can you tell me a litle bit about the time line for designing the banner/bunting/invitation cards and etc before the event that we’re going to do on nov 2012..and when it to be done? OK. so the program will be held next year. I’m sure there will be plenty of time for the works. Here’s my proposal of the estimated timeline. Next is advertising and promotion. If the promotion is one month before the event, which is October 2012, then the design job will have to get started 3 months earlier. So I’ll suggest that you can start with the designing in the middle of July 2012. This is to give ample time for the design team to come up with good design for the event. hi,btw thanx again. This information is very useful and helped me a lot in completing my task. but I’m still stuck in preparing the WBS till now. hehe. esp in scheduling the timeline for the gantt chart. and i hope u don’t mind to explain a lil bit more about the scope of work in this area? TQ.